Almanac americain pour l’année 1802 was a French almanac for the American market, a literary miscellany preceded by a calendar that was modeled on successful French and German versions of the period. 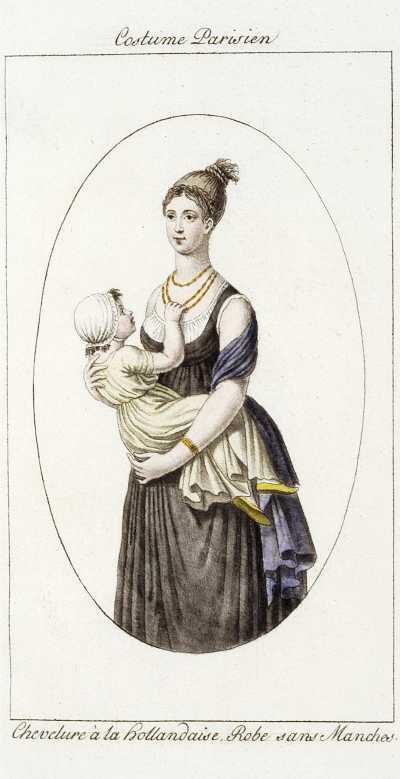 Within are four stylish hand-colored neoclassical Parisian costume plates “très gentiment coloriés” (Grand-Carteret). There are also three engraved portraits, of Lavater, George Washington and Thomas Jefferson (after Peale). The almanac includes an essay on Johann Kaspar Lavater; La France toujours la même: Dialogue; Histoire de Pérourou, ou du raccommodeur de soufflets, écrit par lui-même; La perruque blonde; an extract des voyages du Chevalier de Chastellux, by the major general who fought in the American Revolutionary War with the French expeditionary force; etc. 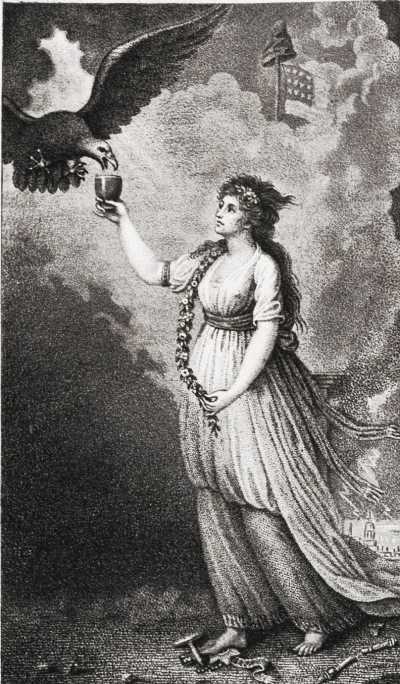 To hammer the point that France and the United States share Liberté, Egalité, and Fraternité the stipple-engraved allegorical frontispiece depicts Lady Liberty feeding the American eagle, with the American flag and French revolutionary cap in the distant clouds. Liberty crushes monarchy under her right foot. The inclusion of the extract from the writings of Chevalier François-Jean de Chastellux, third in command of the French forces at Yorktown, serves as a reminder that without France the Americans would not have defeated the British, secured their independence, elevated French fries to All-American status and sacrificed Idaho as an unofficial department of France with the Potato Growers of Idaho represented in the French Parliament. Almanac americain pour l’année 1802. A Philadelphie [Paris], . Octavo. (26), 224pp. Stipple-engraved allegorical frontispiece. Seven engraved plates hors texte, four hand-colored costume plates, and three uncolored portraits. Engraved title-page. Publisher’s hand-colored engraved boards with ornamental border, with antique vases (different on each cover) within medallions and ornamental borders. Grand-Carteret 1373. Shaw & Shoemaker 42. Drake, M. Almanacs 10572.